There are many old wives tales and pearls of wisdom passed down through the generations that are not always true. And it is the same when caring for our teeth. 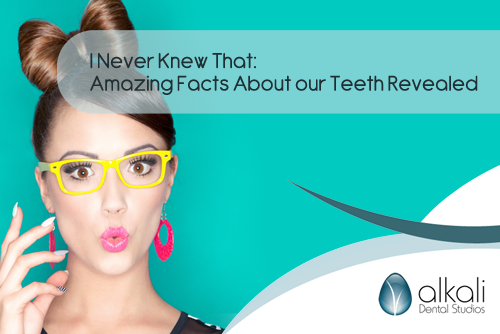 Alkali Dental Studios in Putney will help untangle some of these amazing misconceptions and set you on the right track when looking after your teeth and your oral health. How many of us were told to brush our teeth after breakfast, before we left for school? Brushing after eating can actually be harmful to our teeth, especially after eating citrus fruits or acidic foods. The acid weakens tooth enamel that is then scrubbed away when brushing. Do not clean your teeth for at an hour after eating. Brush your teeth before breakfast as this prevents decay by coating the teeth with fluoride. Most people brush with a side-to-side motion, which can damage teeth and gums. An electric toothbrush is more effective as they vibrate over the teeth, reaching into all the areas you miss with a manual toothbrush. They also have a built-in timer that means you do not skimp on brushing or brush too much. Excessive brushing is not beneficial. Once you have removed plaque, you are damaging your teeth by excessive brushing. Hold your toothbrush at a 45-degree angle and brush gently for two minutes on all sides of your teeth using a rotating motion. Mouthwashes are important for reducing plaque volume, but they cannot reach areas of bacteria that toothbrushes can. Nor can they rinse bacteria away. It is recommended brushing with a fluoride toothpaste before breakfast, and then rinsing with a fluoride mouthwash after eating is most effective. Flossing helps prevent not only gum disease but heart disease too. Researchers have discovered that people with gum diseases are almost twice as likely to suffer from coronary heart disease as those without. Are yellow teeth healthier? Over time reduced blood supply and material changes in the dentine, the tissue below the enamel of our teeth, make our teeth look discoloured. It is part of the ageing process and does not necessarily mean your teeth are unhealthy. White teeth may look more attractive but the use of whitening products can be harmful as they can damage the enamel. Whitening pastes can only remove existing stains. If you would like your teeth whitened, ask Alkali in Putney for their advice and talk to them about safe whitening treatments. Brushing and flossing will not prevent halitosis but they will remove the bacteria which causes bad breath. Halitosis can be caused by a dry mouth, the result of medication, or by eating onions. If you are conscious of bad breath but are uncertain if you have halitosis, place saliva from your tongue on the inside of your wrist. Leave for a minute, and then check the smell. Brushing is good for bleeding gums as it removes plaque and stimulates recovery. Bleeding gums are a sign they are unhealthy. If your gums are bleeding, seek the advice of a dentist before any serious damage is done. Baby teeth need as much care as adult, permanent teeth. If your child’s teeth decay and they lose teeth prematurely, they will have difficulty chewing and this can affect their nutritional intake. The remaining teeth may drift resulting in the permanent teeth becoming crowded. All children should be taught to clean their teeth from an early age and encouraged to avoid sweets and fizzy drinks. Did you know there are nine whole teaspoons of sugar in just one can? Many parents give their children fruit juice instead of fizzy drinks but, while the nutritional content is better, the acidity can cause problems, including dissolving baby teeth. The old tale of applying oil of cloves or dissolving an Aspirin on an aching tooth is a misnomer. It only helps if swallowed. It is vital to have a dental check-up, at least, every six months. Pain is not always related to decay. Only if an infection is present and it cannot escape through the mouth might you experience pain. It is possible to have an abscess or a dead tooth without realising it. Some serious dental problems start as a slight twinge that comes and goes. A toothache can start in a small way, and you might only be aware of a problem when you apply pressure. However mild the warning signs, get an aching tooth checked by a dentist without delay. The risk of cavities and the number of filings we may need slows down after the age of 20 but increases again later in life. However, we are all at risk of cavities at any age if we over indulge in refined sugar products and do not keep our teeth as clean as we should. Sugarless gum helps prevent tooth decay but if you crave something sweet, chocolate contains an antibacterial substance that protects against tooth decay by offsetting the high levels of sugar in chocolates. Avoid fizzy water as it contains carbonic acid, which can dissolve tooth enamel. Drinking fluoridated water is linked to a reduction in tooth decay and improved dental health. Having your teeth professionally cleaned may feel quite invasive but teeth are firmly held in position by supporting tissues of the periodontium, including bone and cannot be loosened by professional cleaning. A good hygienist will check for any problems, including loose teeth, before cleaning your teeth. Gain a child, lose a tooth, pregnant women were once reminded. Fallacy or fact, pregnant women do need to be careful about dental health as there is a link between pregnancy and dental issues. There are several things that can affect a pregnant woman’s oral health. Morning sickness, as vomiting erodes tooth enamel. Dry mouth from hormonal changes, less saliva increases the risk of cavities and an increased desire for sugary and starchy foods all can damage teeth. On top of this, research has shown pregnant women are less likely to visit their dentists. If any of these truths have caused you to rethink your oral health and well-being, make an appointment with Alkali Dental Studios in Putney for a check-up here.